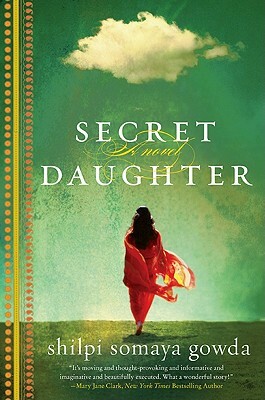 Secret Daughter, a first novel by Shilpi Somaya Gowda, explores powerfully and poignantly the emotional terrain of motherhood, loss, identity, and love through the experiences of two families—one Indian, one American—and the child that binds them together. A masterful work set partially in the Mumbai slums so vividly portrayed in the hit film Slumdog Millionaire, Secret Daughter recalls the acclaimed novels of Kim Edwards and Thrity Umrigar, yet sparkles with the freshness of a truly exciting new literary voice. First novelist Gowda offers especially vivid descriptions of the contrasts and contradictions of modern India... Rife with themes that lend themselves to discussion, such as cultural identity, adoption, and women’s roles, this will appeal to the book club crowd. It’s moving and thought-provoking and informative and imaginative and beautifully executed. What a wonderful story! The Secret Daughter is a deeply moving and timeless story of an adopted daughter’s long distance search for cultural identity and acceptance; first with the mother who raised her, and ultimately with the mother who gave her up. In her engaging debut, Gowda weaves together two compelling stories… Gowda writes with compassion and uncanny perception from the points of view of Kavita, Somer, and Asha, while portraying the vibrant traditions, sights, and sounds of modern India. This wise debut moves deftly between the child’s two mothers and cultures. A No. 1 bestseller in Canada, “Secret Daughter” tells a nuanced coming-of-age story that is faithful to the economic and emotional realities of two very different cultures.